If you’re talking about sports franchises, schools or universities, it’s quite the norm. 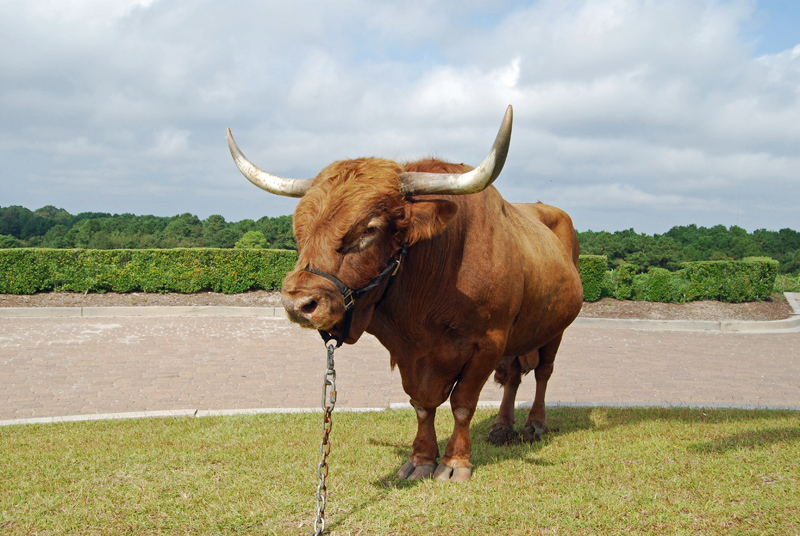 But Bulls Bay is certainly rare, if not unique, when it comes to golf clubs in that it had its own mascot. 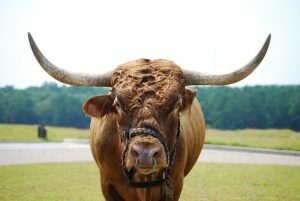 Titleist, an imposing 1,400-pound bull, was Bulls Bay’s mascot since the club opened in May 2002. 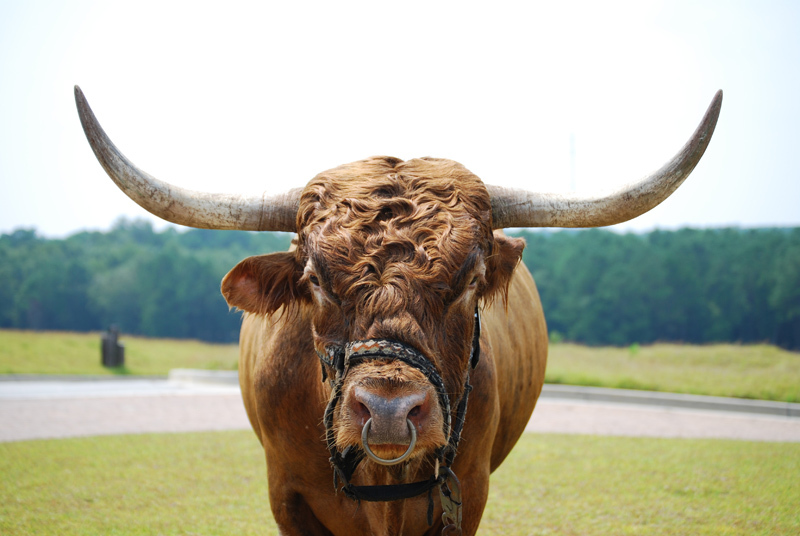 Club founder Joe Rice, as much of an equine enthusiast as he is golf lover, purchased the striking Scottlish Highland-Texas Longhorn mix at a horse auction in early 2001. 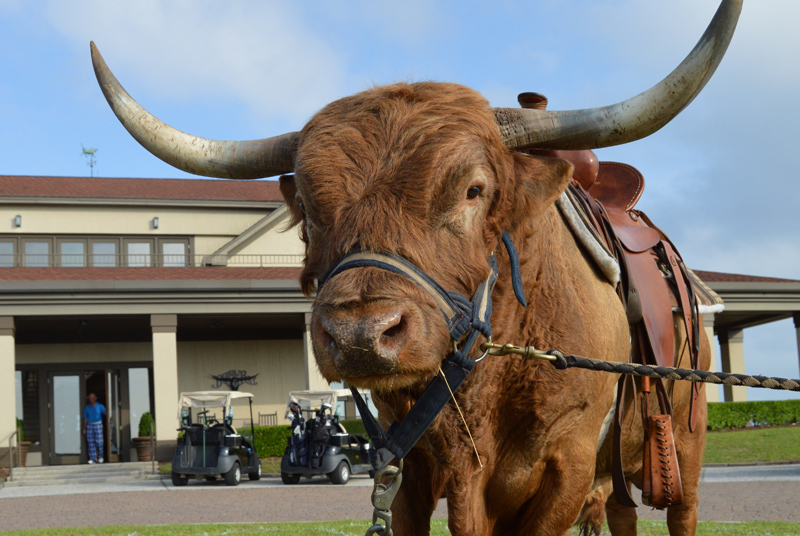 And when the Mike Strantz-designed golf course was completed and Bulls Bay Golf Club opened, it seemed a given that Titleist become the “official” club mascot. 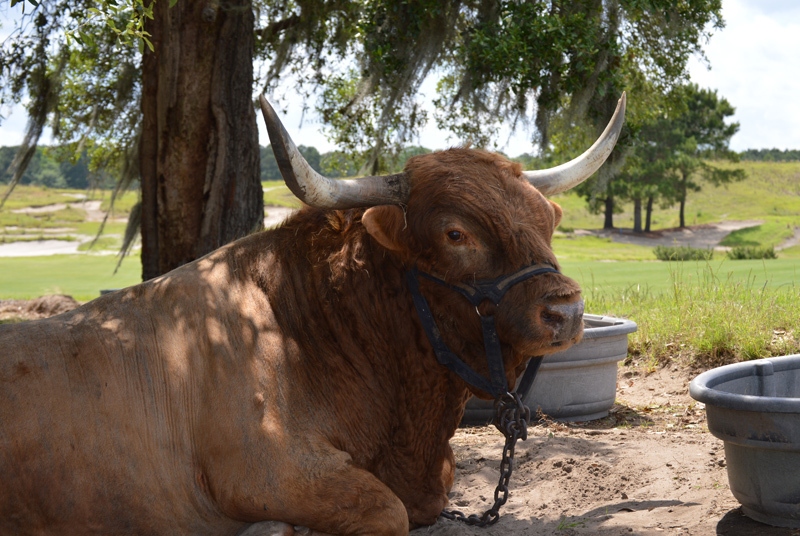 Titleist lived on a farm near Holly Hill, where he consumed some 50 pounds of hay and 20 pounds of feed daily, but he would make several appearances at the club annually. 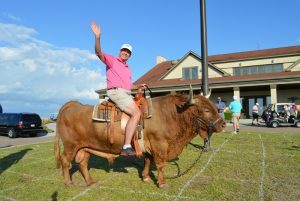 Each visit coincided with a major golf event – be it a club championship, member-guest or the annual Hootie at Bulls Bay Intercollegiate – and no championship was complete until the winner or winners had taken a ceremonial ride on the usually cooperative bovine. Titleist spends most of the two-day event glaring balefully at passing players from a shady spot well to the right of the 18th fairway. But as the tournament’s conclusion, he’s led to the front of the clubhouse, where he is tethered to a flagpole at the center of a 100-square grid chalked by the tournament staff. The chain is just long enough for the bull to reach the perimeter of the grid. The contest that ensues is not unlike Super Bowl pools conducted in your neighborhood bar. Individual squares are sold in advance for $50 apiece, and a random drawing determines which square an entrant owns. Once Titleist is in place, the rooting begins. The enormous amount of feed he consumes doesn’t stay in his belly long, and once the journey through his digestive tract is complete, it exits onto the field of play. The lucky square owner gets half the cash, and the other half goes to the Terry Florence Golf Endowment which awards scholarships to college students attending school in South Carolina through the S.C. Junior Golf Foundation. 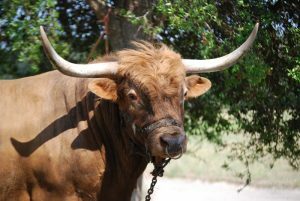 Titleist passed away in June of 2016.